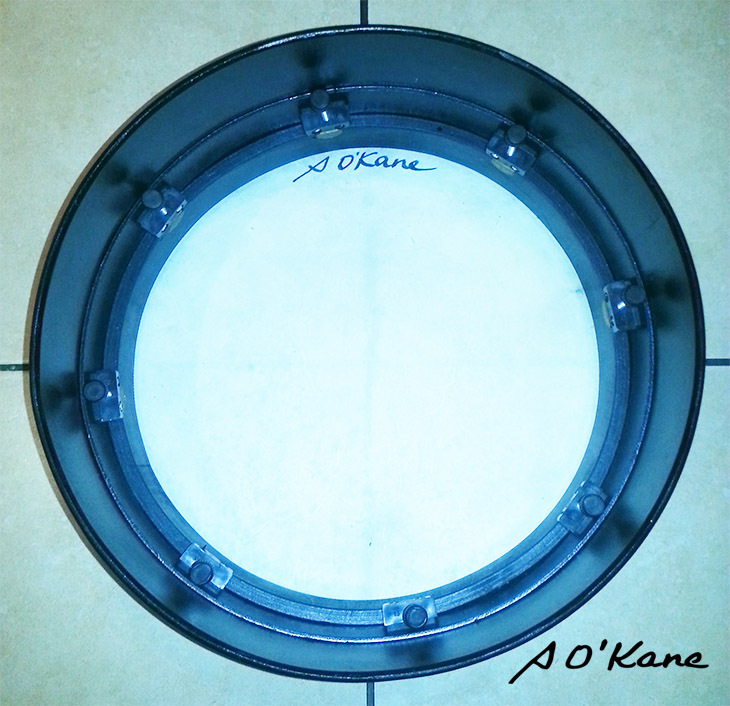 ﻿ :: seamus o'kane :: 50 years of bodhrán making & invention. 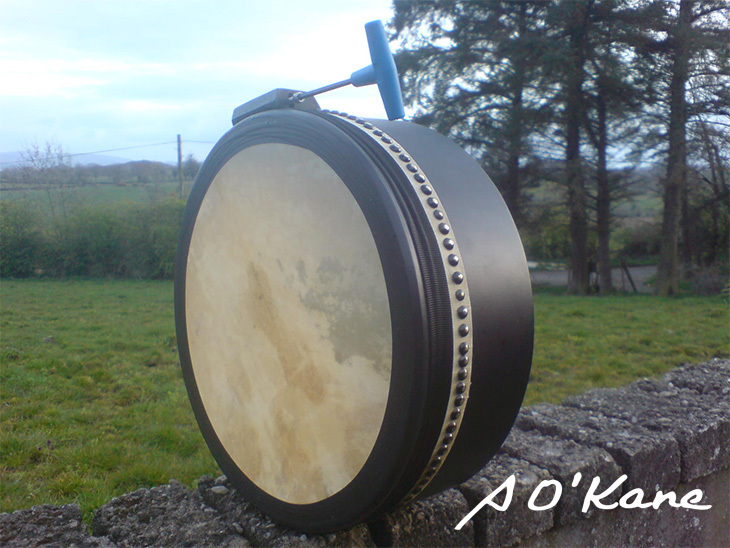 now making bodhráns between 4.5"s - 6"s depth, on request. Thanks, Seamus. 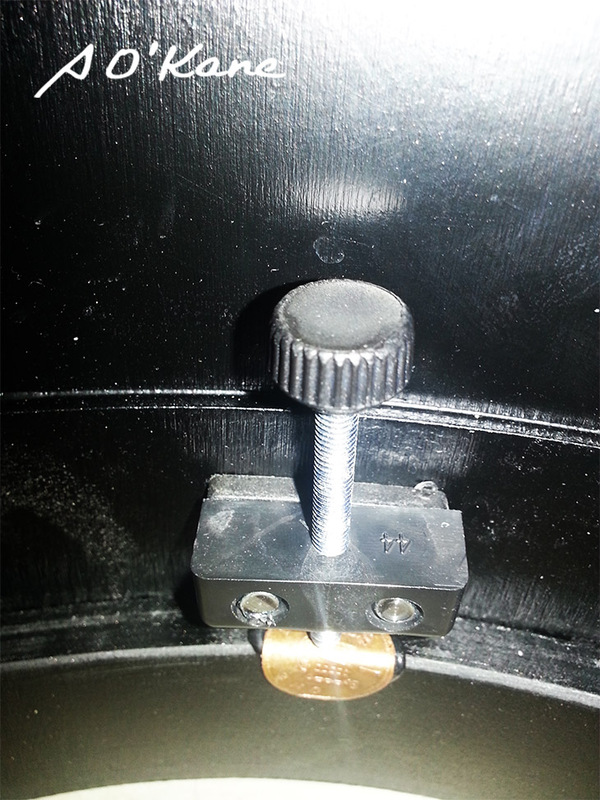 Since the fashion in drums has changed I have started to make the 8 screw type into a finger tuning system. In the 80’s I made a metal finger tuning system by brazing 2 intersecting washers into the cross heads of spouting bolt . 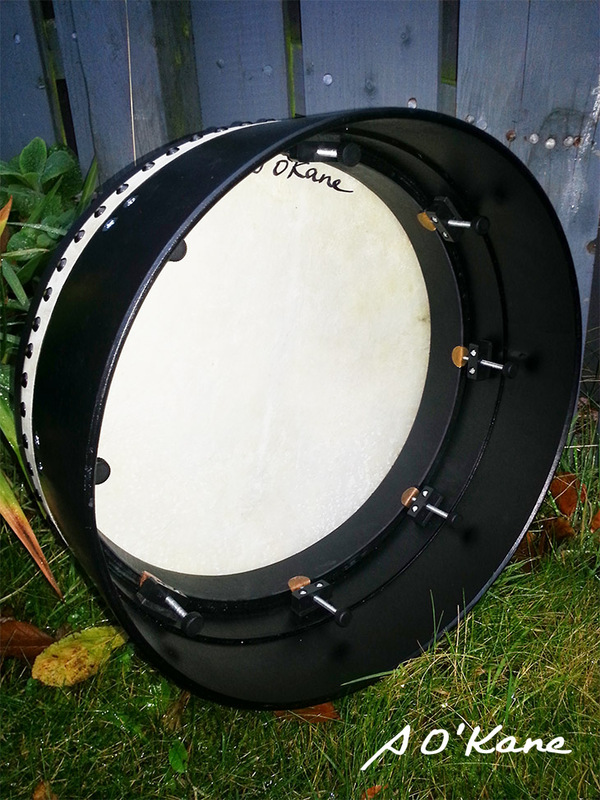 I still have this drum that I use as a sound reference. 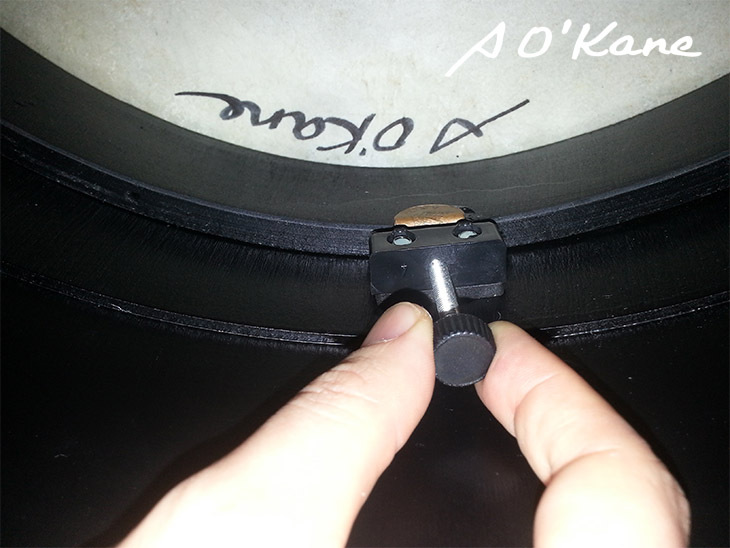 The plastic knobs are tilted away from the shell for ease and comfort of use (see 3rd photograph below) and the operational tensioning length much increased to cover every possible tuning situation. 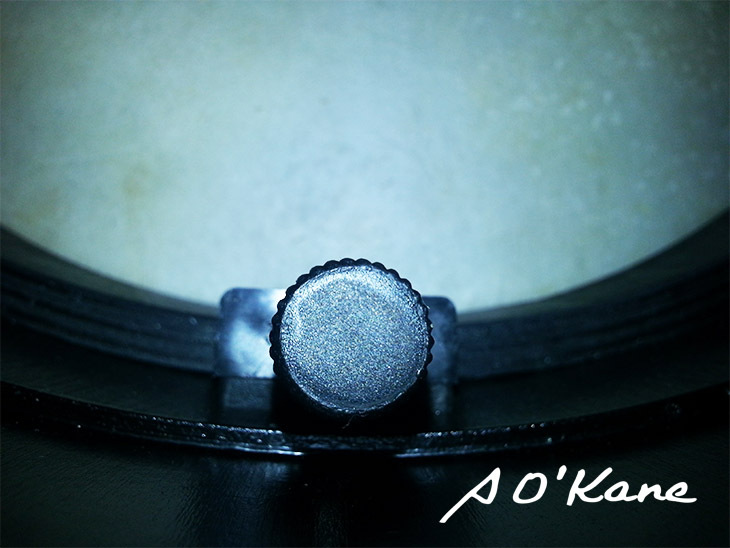 I suppose to call this a new design would be an exaggeration since it is simply the replacement of a screw for a knob. 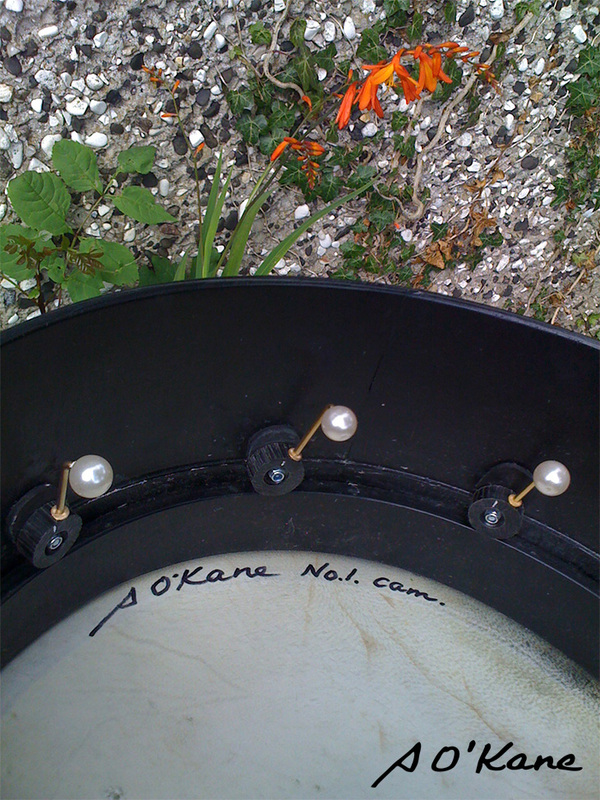 Still in pursuit of a single screw system I reverted to what I had made to tension the old Snowcem tin drums when I was young. For a variety of reasons of both usability and sound production it is an improvement on all other systems. However it has its limitations in countries where there is a very wide range of humidity variation. For those conditions I now feel happier to supply the 8 screw, or 8 knob type. It is very suitable within; Ireland, Scotland, England and Wales. Since nobody has developed the old cam system I decided to revamp it for the ladies because of the availability of new materials and fittings. I have simply increased the tuning range by making the cam bigger and from Black Delrin The delrin edge is roughed up to make an friction surface between the wheel and tone ring edge. This is done to prevent slipback. This again makes the system a finger tuning system.